INDIANAPOLIS – The Western Panthers entered the 2012 season with a new coach, a new quarterback and a new playbook courtesy of head coach Nate Andrews. So when they traveled to Indianapolis to play Class 3A No. 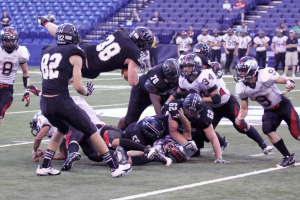 7-ranked Eastbrook in the Ivy Tech Invitational at Lucas Oil Stadium, many thought the less-experienced Western squad would be overmatched – but that was not the case. Despite a 33-16 loss, Western showed they belonged in the game; they will just need to cut down on the miscues. Turnovers were the key to the game, as four Western interceptions spelled doom for the Panthers. Two proved costly as they were returned for touchdowns – including the first score of the game. Heath Brooksher returned a pick for 51-yards in the first quarter. Trailing 12-0, Zach Simpson put the Panthers on the board with a knuckle-ball 37-yard field goal, but Jacob Singer connected with Mac Zoda on a 45-yard pass to put Eastbrook up 19-3 heading into the half. James Davis, seeing his first action of the season, found pay dirt for Western in the third quarter to cut the lead to 19-10. Then, following an Eastbrook punt, Western seemed to be driving for a second score, only to see Singer grab his third interception of the game and return it 50-yards for a back-breaking touchdown. Singer would find the end zone for a third time early in the fourth quarter to put the game away for Eastbrook. “Eastbrook is Eastbrook, and they are going to make the plays they are supposed to play,” Andrews said. Davis finished with a game-leading 188 yards on 28 carries while Hudson Featherstone added another 43 ground yards. Drew Bellus passed for 52 yards, with Ronnie Smith snagging five catches for 39 yards. Western (0-2) returns to action Friday night against Taylor (0-2), while Eastbrook (2-0) battles Alexandria (2-0). This entry was posted in Football, High School, Lucas Oil Stadium, Western. Bookmark the permalink.